Elaps boaeformis Schneider, 1801, 2: 301. Homalopsis molurus: Boie, 1826: 213. 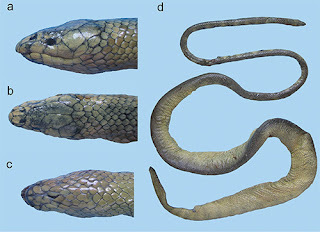 Python boaeformis: Merrem, 1820: 89. Homalopsis schneiderii Schlegel, 1837: 341. Homalopsis rhinchops: Cantor, 1847: 91. Cerberus acutus Gray, 1849: 65. Holotype: BMNH 1946.1.2.34. Type Locality: Borneo. Cerberus unicolor Gray, 1849: 65. Holotype: BMNH 1946.1.2.45. Type Locality: Philippines. Cerberus rynchops: Bleeker, 1857a: 233. Cerberus boaeformis: Bleeker, 1857b: 238. Hurria rynchops: Stejneger, 1907: 302. Cerberus schneiderii: Murphy, Voris and Karns, 2012b: 17. Lectotype: RMNH 1173. Type Locality: Timor. Distribution: Andaman sea coast of Thailand eastward to the Philippines and southward throughout Peninsular Malaysia and Indonesia to Halmahera and Seram (Murphy et al., 2012b). Diagnosis: Dorsal scale rows in 23 (rarely 25) scale rows at mid-body; the imbricate plate-like scales on crown have flat, thin appearance, lack keels anterior to angle of jaw; last upper labial horizontally divided; venter mottled.